With temperatures staying this hot throughout the fall, we want to make sure all of South Florida stays cool and comfortable in their homes throughout the holidays. All Year Cooling, a local South Florida air conditioning installation and repair company is helping Florida residents cool their home or business with a deal on their new AC unit installations. The offer also includes same-day installation. All Year Cooling is running this sale now through November 14, 2017 and is also offering same-day installations if booked by 1 p.m.
All Year Cooling is looking to help residents and business owners with any air conditioning service whether they’re in need of a new unit, maintenance, or duct services. 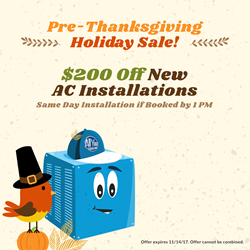 With this latest coupon, All Year Cooling is offering $200 off new air conditioning units and same-day installations when customers book by 1 p.m. This offer cannot be combined with any other coupons. Established in 1973, All Year Cooling has completed over 300,000 air conditioner installations in South Florida. Tommy Smith and his team’s goal is to provide the consumer with the best overall value on new air conditioner installations, maintenance, and repairs. As a family-owned business, it’s their mission to provide quality service and remain a trusted part of the South Florida community. For more information on All Year Cooling, please visit their website or call 888-204-5554.